Past seven days: At the start of the week, ex-tropical cyclone Wallace was located offshore from the Pilbara coast of Western Australia, and moved west to south-west away from the mainland. A monsoon trough north of Australia stretching from embedded ex-tropical cyclone Wallace, and a tropical low in the Timor Sea through the Arafura Sea, generated thunderstorms over the Kimberley in Western Australia and the Top End of the Northern Territory. A broad surface trough with a developing cloud band extended from the west Pilbara to the southern coast of Western Australia, while a weak cold front brushed the south-west of the State. These features generated showers and thunderstorms with moderate falls in parts of the Pilbara, Gascoyne and south coast of the Western Australia. In the east, a trough extended through inland Queensland, and brought light falls to areas of central Queensland. In the middle of the week, a weak cold front tracked across Tasmania, resulting in light to moderate falls in western parts of the State, and light falls in parts of southern Victoria and south-eastern South Australia. Moist onshore flow produced showers and moderate falls in south-east Queensland and north-eastern New South Wales. The weakening tropical low moved west and produced moderate falls along the Pilbara coast. From the middle of the week, thunderstorms and showers developed along the west coast and adjacent inland areas of Western Australia due to a developing surface trough near the west coast, ahead of a series of weak cold fronts. Moderate falls were recorded across large parts of the Pilbara and Gascoyne, extending into parts of the South West Land Division and Goldfields District. 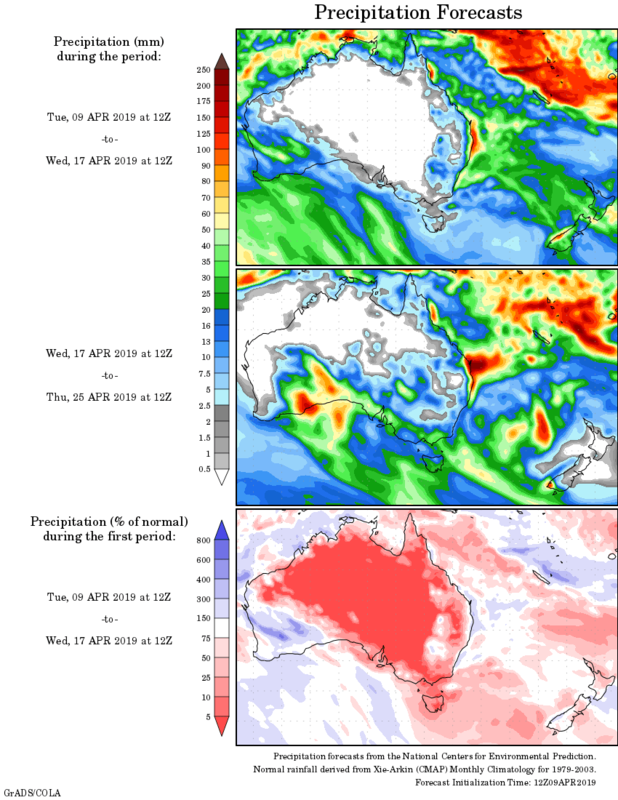 Onshore flow resulted in showers along Queensland’s north tropical coast and parts of the northern Cape York Peninsula, and areas of the north-east to central coasts of New South Wales for the remainder of the week. 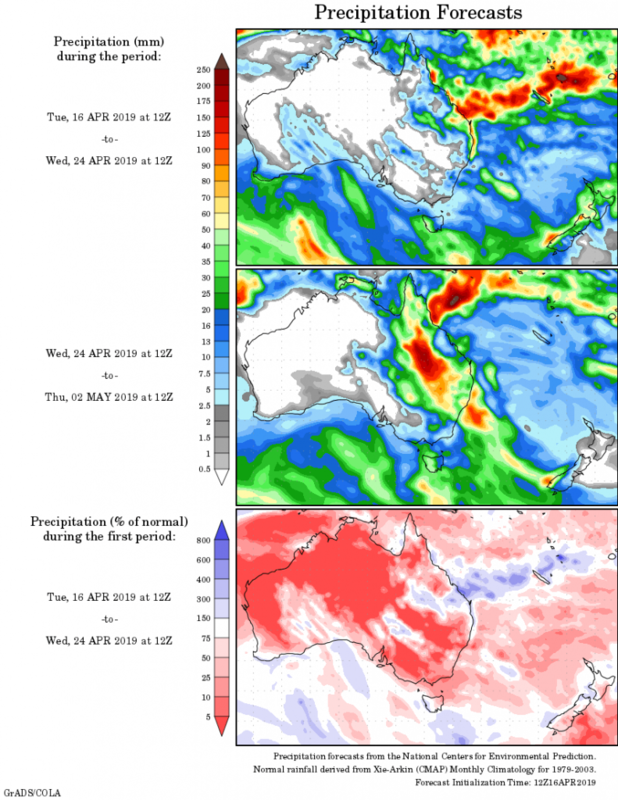 Rainfall totals in excess of 50 mm were in parts of Queensland’s north tropical coast, an area of the northwest Top End of the Northern Territory, and the north-west coast and Gascoyne District of Western Australia. Rainfall totals between 10 mm and 50 mm were along the south-west Kimberley coast and Gascoyne District in Western Australia; parts of the north-west and north-east Top End of the Northern Territory; about the Cape York Peninsula, north tropical, central and south-east coasts of Queensland; the north-east to central coast of New South Wales and in western Tasmania.